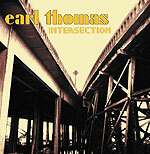 San Diego's Earl Thomas has one of the most expressive voices in pop music. Rich in timbre, possessed of a halting vibrato to make Elvis jealous, Thomas' pipes are the goods. And yet, odds are most folks reading this have never heard of Thomas. Part of that is undoubtedly the fact that Thomas' chosen style of music is soul  old-school, R&B-flavored Memphis soul a la Otis Redding or Ike & Tina. Not exactly ruling the charts these days. But part of it has also been Thomas' erratic recording history. For the first time in a decade-and-a-half long career, Thomas seems to have stability in his professional life  and the results are so splendid this may be the shot in the arm his career needed. His second album on the Memphis International label picks up where 2003's "Soul'd" left off  with some first-class old-school soul built around Thomas' golden voice. A nice mix of covers and originals, "Intersection" finds Thomas confident, sly, utterly in command. From an opening cover of the old Ike and Tina hit "Workin' Together" to a turned-inside-out reading of the Stones' "Brown Sugar," Thomas is clearly having the time of his life. Soaring, swooping, caressing  Thomas and that voice are surrounded by talent enough to push him, and the results are some of the best soul music created in the past few decades.